So this is another one of those cases where… we’ve featured a composer many times before talking about them individually. Actually, Tchaikovsky’s post wasn’t an Influential People post, but that’s beside the point. Today’s is. We’ve talked about a number of Scriabin’s works before already, but only a few piano sonatas (here, here, and here, in order) and the piano concerto, all relatively from the composer’s ‘early period’ or ‘first period’ or whatever it’s called. We’ll get to that later. As a human in the Russian Symphony Series, he’s perhaps a bit… out of place? His Russian pedigree isn’t as far-reaching as some others, who can claim to have studied with Rimsky-Korsakov and/or Balakirev and/or one of a few Rubinsteins. Born on Christmas day of 1871 (Julian Calendar, or January 6, 1872 in the Gregorian) in Moscow, Scriabin (also) was raised in a family with a military heritage. His mother was apparently a rather accomplished pianist herself, but died when the young Alexander was only a year or so old. Daddy Scriabin was (or became) a diplomat and left for Turkey, leaving his young son (and the rest of the family?) to the (remaining) women of the house: our young composer’s grandmother, great aunt, and aunt, the last of which was apparently also an amateur pianist and had a fine relationship with her nephew. So there’s lots of military and seemingly as much piano playing in the Scriabin home, but it seems he was fascinated with the piano, demanding that someone play for him before he himself learned. Apparently (says Wikipedia, no matter how unbelievable it sounds), he would build pianos, also fascinated with their moving parts, and give his completed instruments to house guests. This makes him sound like a very young, obsessed, almost mad-scientist type of child, and his auntie portrayed him kind of as such: shy and unsociable, precocious and perhaps interacting better with adults. There’s an anecdote in the linked article of him trying to conduct an orchestra of his peers (for some reason I got the impression and have this image of like, a bunch of seven-year-olds with seven-year-old sized instruments, but that isn’t specified), “an attempt that ended in frustration and tears.” He’s already working that tortured soul artist thing. The first big name, the name of the big man in the center of the above photo, is Nikolai Zverev, a person who hasn’t yet figured into our discussion at all. Zverev studied mathematics and physics, and took piano lessons from people like Alexander Dubuque and Adolf von Henselt. 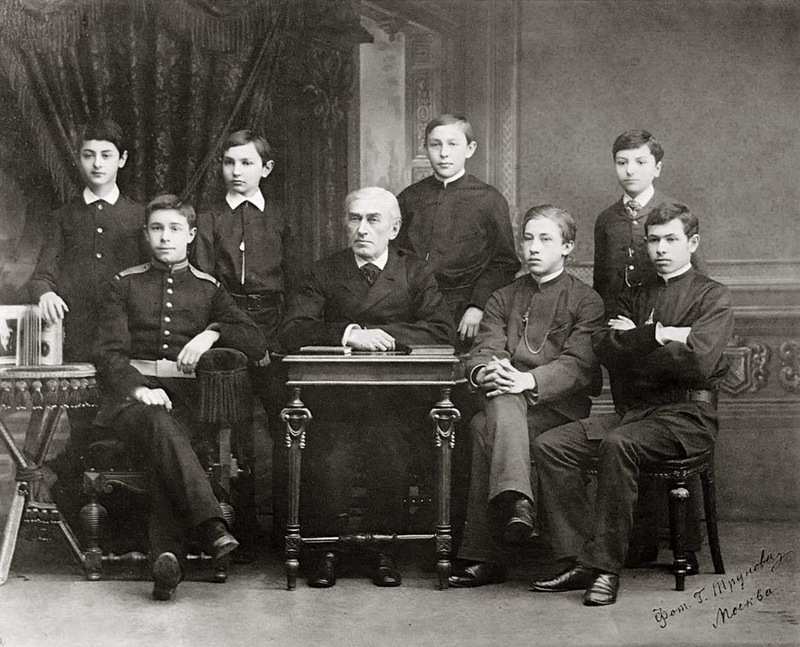 He moved to Moscow in 1867 and became a teacher at the Moscow Conservatory at Nikolai Rubinstein’s request, and apparently studied under Tchaikovsky for a time. Those are his closest connections to the characters we’ve introduced so far. He also ended up teaching a number of very famous composers and pianists, among them being, of course, Scriabin. You may recognize a taller face in the above photo as well. While it seems the two might not have been terribly close or gotten to know each other very well, Scriabin studied under Zverev with one Sergei Rachmaninoff. At the age of only like, ten or eleven, though, he enrolled in the Second Moscow Cadet Corps (some kind of Russian boy scouts?) but because he was a bit more frail and sickly (and apparently also smaller than the other boys), he got picked on by them but was also allowed exemption from some of the daily drills to practice. After all that, as a young adult, he studied under some far bigger names, one of whom we’ve discussed so far: Anton Arensky. Also included were studies with Sergei Taneyev and Vasily Safonov. The exact opposite of his fellow Zverev pupil, Scriabin had quite small hands, apparently only barely reaching a ninth, and famously injured his hand working on Balakirev’s Islamey and a Liszt work; being told by the doctor he would never recover, he wrote his first big work, the first sonata, in anguish. These works all belong to the composer’s first or early period. (As a side note, he didn’t complete a composition degree because of differences with Arensky, who refused [or neglected] to sign his graduation certificate). Despite that, his early success in his career came more as a composer than pianist, when Mitrofan Belyayev recruited the young man to compose under his publishing company (or at least agreed to pay him for his works). After some touring as a pianist, he also took up at the Moscow Conservatory, where he began to be known as a composer more than performer. Let’s now just talk about his works. And to do this, I think, we look not to Rubinstein or Zverev or Arensky or anyone else but Chopin. This is evident not only in the style of his earliest compositions, but also their forms. He was not only a composer who stuck almost solely to the piano, but also produced such famed Chopinist forms as etudes, preludes, waltzes, mazurkas, and even nocturnes (no ballades, though). Scriabin also died quite young, but despite this, in his small, compact career, showed immense development and evolution through the three major periods of his career. I’ve always felt (mostly because they’re the works I instantly gravitated to and are thus the most familiar with) that the entire course of his career can be kind of… summed up or embodied by the progression of his ten piano sonatas. They are a great way to get an idea of what Scriabin was like in a given point in his life. While the fourth sonata, I feel, is much like the second in some ways, it has many similarities to the fifth, and these two sonatas (no.s 4 and 5) are the ones that mark his second period, and I am extremely eager to get around to talking about them eventually. After that is the Scriabin that’s perhaps most infamous. After the fifth, his first one-movement sonata, all of the others followed suit. These are the works that sound eerie and dark and mysterious and have wild tonalities and break away from the traditional harmonic language of the past. Famously, Scriabin refused to play his sixth or eighth (ninth?) sonatas in public, and wrote the seventh as a kind of purifying work after the dark sixth. They’re fascinating, complex, really genius things, and this late period is the one where Scriabin really had the gumption or passion or compulsion to express his theories and ideologies on religion and philosophy through his music. Scriabin developed his own very personal and abstract mysticism based on the role of the artist in relation to perception and life affirmation. His ideas on reality seem similar to Platonic and Aristotelian theory though much less coherent. The main sources of his philosophy can be found in his numerous unpublished notebooks, one in which he famously wrote “I am God”. So, also, another word I would use to describe him is, well, a bit crazy. He was also a synesthete, and had strong associations between sound and color. I had the wonderful opportunity to hear his Poem of Fire here in Taipei with the color show! It was quite something. He was certainly a passionate, determined, and driven composer, and you can’t help but hear it in his writings. These aren’t the mindless wanderings of a madman backforming strange program ideas onto a wash of nonsense music, no. They’re consistent and expressive and wholly, completely, wonderfully unique. Lots of Debussy (or just Frenchiness) can be heard in pieces like his fifth sonata, such rich color and expression. I’ve really come to love all the sonatas, and some of his later ‘symphonies’ (tone poems?). But as the title of this series would suggest, he was also very influential. If we skip to the “Reception and Influence” section of the Wiki and scan through it, we first read that when he died (tragically, at the age of only 43), so many people attended the funeral that tickets had to be issued. Both Rachmaninoff and Prokofiev, another contemporary of Scriabin, greatly admired his music and performed his pieces (Rach) and composed in his style (Prok) to commemorate him (maybe?). Even people as seemingly distant as Aaron Copland had wonderful things to say about his music. While there was a time when his music had lost favor (to say the least, even being banned from broadcast for a time in places like England, if you can believe it), there were some who fervently worked to preserve it, like Kaikhosru Sorabji (another very interesting human). In any case, aside from some wavering sentiments toward his music and apparently not having any world-famous pupils of his own, his incredibly creative, individual voice made huge impressions on a host of Russian composers to follow, the most direct of which is likely Nikolai Roslavets. I thought we’d gotten around to at least one of his works, but not yet. He went so far as to continue to push Scriabin’s treatment of tonality, and others followed, like Samuil Feinberg (we did a sonata of his! ), Sergei Protopopov, Alexander Mosolov, and even Nikolai Myaskovsky. Soviets later thought this music untoward and had the movement quashed. There’s a lot we didn’t discuss here, but in short, Alexander Scriabin was a composer who walked out of a very Romantic era of music, and with that as his starting point, took an ever more individual and independent course in the development of his own voice, leaving behind one of the most unique oeuvres in history. On Thursday, we will discuss his first symphony, a piece in which his ideas on existence and art as religion are (maybe not) first (but early) expressed. See you then.